Sea turtles often live near humans in shallow sea water and open estuaries. Seven known species of sea turtles exist and these creatures can live for an astonishing 80 years. Sea turtles live most of their lives in the sea, but venture onto dry land to have their babies, and turtles of both sexes can be seen tending to them. Males and females are often the same size, making it difficult to tell them apart. Look at the sea turtle's front flippers. All male sea turtles, except leatherbacks, have long and curved claws. It is unknown why these claws exist, but some scientists suggest it is to grasp the female's shell during mating. Observe the sea turtle's tail. Sexually immature males and females both have short, stubby tails. 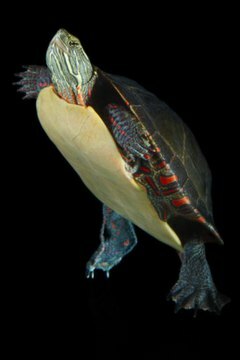 However, only sexually mature male turtles develop a longer tail, which houses their sexual organ. Sexual maturation occurs at vastly different stages for different species of sea turtles, from three years old for hawksbill turtles to 50 years old in green sea turtles. This can make telling a male from a female difficult. Watch sea turtles during the warmest part of the year (typically summer, depending on the climate in which the sea turtles live). Female sea turtles will be the ones to lay the eggs, although both sexes are known to watch over them.